OpenTable Reveals Top 25 Most Romantic Cities in America for 2018 | OpenTable, Inc.
SAN FRANCISCO, Feb. 8, 2018 /PRNewswire/ -- As we prepare to celebrate love and romance on Valentine's Day, OpenTable, the world's leading provider of online restaurant reservations and part of The Priceline Group (NASDAQ: PCLN), is pleased to reveal its 2018 rankings of the 25 Most Romantic Cities in America. While diners across the nation are looking for that special meal on Valentine's Day, certain cities prove that they are a step above in providing dining experiences that exude romance from the moment you step inside the restaurant. To identify the ranking of cities where romantic dining is inherently part of the culture, the OpenTable Most Romantic Cities Index was calculated using three variables: the percentage of restaurants rated "romantic" according to OpenTable diner reviews; the percentage of tables seated for two; and the percentage of people who dined out for Valentine's Day in 2017. "From cozy seaside settings such as Carmel to hip urban locales like Brooklyn, this year's standout cities and their dining scenes are attracting diners and inspiring romance," said Caroline Potter, Chief Dining Officer for OpenTable. "These breakout romantic dining destinations are staking their claims as hot spots for couples who celebrate their relationship with enchanting restaurant experiences on Valentine's Day -- and every day." The following cities, listed in order, comprise the 25 Most Romantic Cities in America for 2018. The complete list may also be viewed at https://www.opentable.com/m/25-most-romantic-cities-in-america-for-2018/. For diners still searching for a terrific table for Valentine's Day, OpenTable recently released the Top 100 Most Romantic Restaurants in America for 2018. Diners can also find more tips and trends regarding Valentine's Day on the OpenTable Blog as well as details about our #ValenDinesDay Valentine's Day giveaway. OpenTable, part of The Priceline Group (NASDAQ: PCLN), is the world's leading provider of online restaurant reservations, seating more than 24 million diners per month via online reservations across more than 43,000 restaurants. 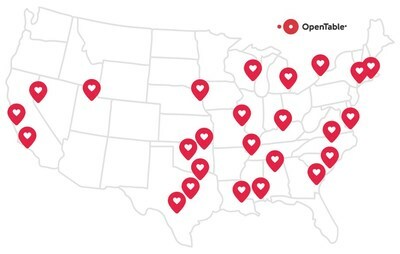 The OpenTable network connects restaurants and diners, helping diners discover and book the perfect table and helping restaurants deliver personalized hospitality to keep guests coming back. The OpenTable service enables diners to see which restaurants have available tables, select a restaurant based on verified diner reviews, menus, and other helpful information, and easily book a reservation. In addition to the company's website and mobile apps, OpenTable powers online reservations for nearly 600 partners, including many of the Internet's most popular global and local brands. For restaurants, the OpenTable hospitality solutions enable them to manage their reservation book, streamline their operations, and enhance their service levels. Since its inception in 1998, OpenTable has seated over 1.4 billion diners around the world via online reservations. OpenTable is headquartered in San Francisco and has bookable restaurants in more than 20 countries, including Australia, Canada, Germany, Ireland, Japan, Mexico, the Netherlands, United Kingdom and the United States. Restaurants are available for reservations in Dutch, English, French, German, Japanese, and Spanish languages.